Ed Schipul took this photo at the Houston Chronicle’s Book & Author dinner last Sunday. Portions of the proceeds from that dinner benefit the Houston Public Library. 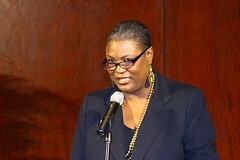 Pictured here is Dr. Rhea Brown Lawson, director of the Houston Public Library. Happy to help the library. I can’t imagine life without books!